I’m once again participating in Dewey’s 24-hour-Readathon. Mini-challenges from Hours 1-3 below! The wild suburbs of Oregon, where we tend our fields of Starbucks and raise our powerful hipsters and strong hippies. ALL OF THEM pictured here. Attachments is really amazing so far, as I expected from Rainbow Rowell. Harvest Snaps LIGHTLY SALTEDDDDDD. They’re so good. I’m a twenty-something crazy dog lady. I make nests out of books and totoros. I’ve got a couple of audiobooks in my stack, which I rarely listen to but I am GONNA DO IT. The Raven Boys by Maggie Stiefvater, and Furiously Happy by Jenny Lawson. Reading Winnie-the-Pooh and The House on Pooh Corner. Over and over and over and over. I definitely had a teddy bear phase and researched teddy bears and collected as many as I could – or rather rescued them from garage sales. The Little House on the Prairie series by Laura Ingalls Wilder. Classic obviously, and I still reread these when I can. Pony Pals series: I gobbled these up, along with any other horse book I could get my hands on (including a horse health book, which leads into a funny story about how I figured out the birds and the bees (it had photos (I don’t know what else to say at this point))). PONY PALS WERE FUN. Reading Usagi Yojimbo while eating PB&J sandwiches was a staple of my childhood. Surprisingly violent considering I don’t generally like reading violence. I started reading Redwall by Brian Jacques in my pre-teens, convinced I could never read such a “big, grown-up book” and then I finished it in three days and it was all over, it was too late, I was a bookworm forever and ever and now I live in a room-full of books. “One more page,” she cursed. Least Enjoyable Book: I guess The Labyrinth? It takes a lot of concentration to read because it’s sort of stream-of-consciousness from the POV of someone who may or may not be completely bonkers. Most Daunting Hour: I always have a hard time after midnight. I fell asleep a little after three this year, so over 22 hours reading! I don’t really have any suggestions for the Readathon. I thought this Readathon was very smoothly run. I saw a LOT of cheerleading, the mini-challenges were awesome, and the various hosts were very active throughout their shifts. “High Interest” Book Suggestions: I don’t have any specific book suggestions because everyone knows what they like. For myself, I always try to choose authors I have read and loved before because I know what I’m getting and I know I’ll be drawn in. I definitely recommend Cathrynne Valente’s Fairyland series (I read book 4 for this readathon). I’ll definitely participate again. 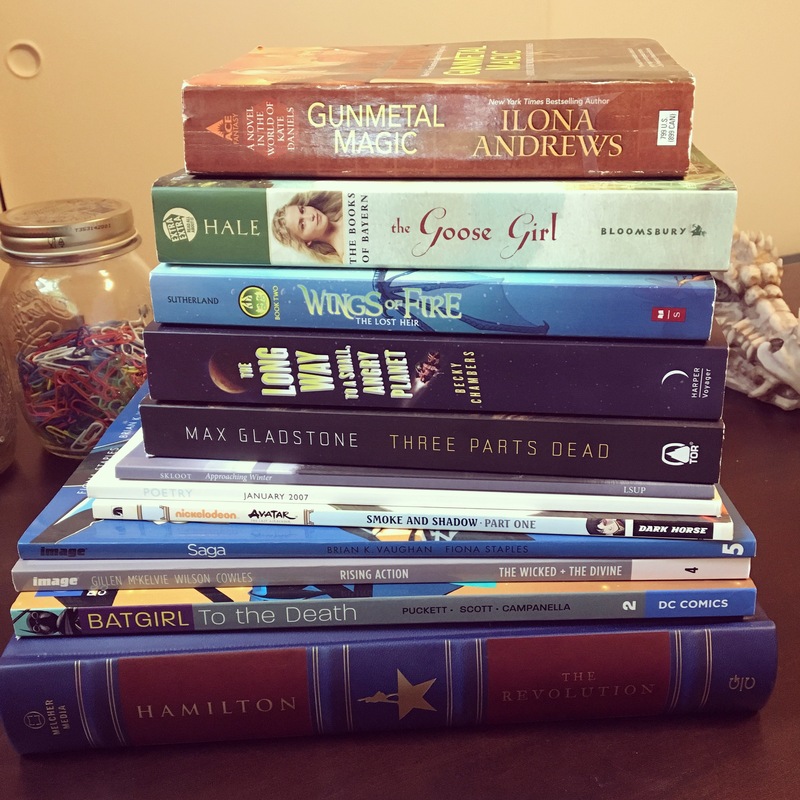 I think this was my third Readathon? I do it when I can because it’s always a thrilling bookworming time!